There’s a plaque at the corner of West Wacker and North LaSalle, just above the Chicago River that most workers, tourists, homeless, cabbies, school children and shoppers hustle by without a glance. The bronze sign marks where 844 people drowned right in the Loop on a summer day. The mammoth Western Electric plant in Cicero once held annual employee parties and promoted them with zeal. Departments competed for the most attendance. It was a rare day off for employees and their families to dress up for a trip to the beach in Michigan City. There would be a parade and picnics, dancing, games and sports, and a cruise on one of the big steamer ships. In 1915 seven thousand put on their Sunday clothes and went into the city to board in the early morning of July 24. 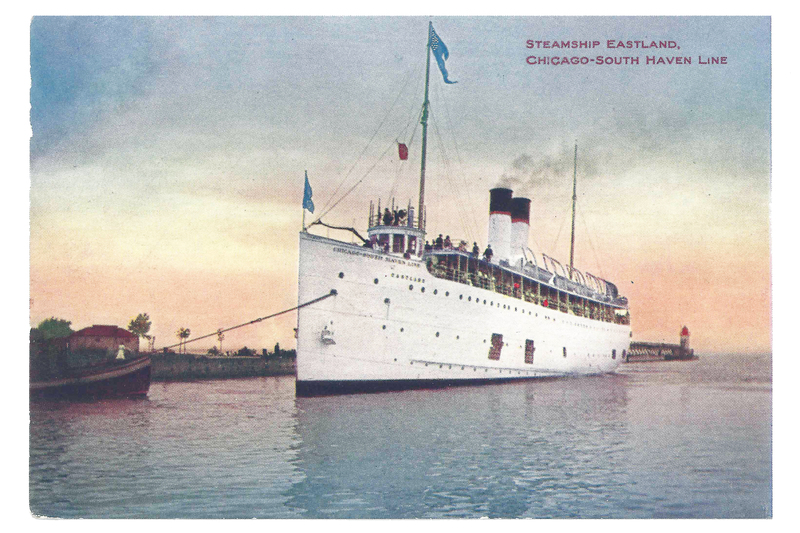 Western Electric hired five excursion steamers to shuttle passengers back and forth and the S.S. Eastland was popular because she was scheduled to depart first. White, elegant, she was slim as a narrow slice of a five-layered cake. The Eastland once sailed regularly between Chicago and South Haven, Mich. loaded with summer vacationers and docked exactly where I now enjoy my summer drinks on the Black River. 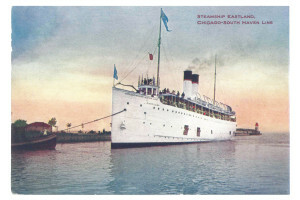 In fact, the Eastland was built to navigate the shallow Black River which made the ship notoriously tippy. On that July day, while 2,500 Western Electric people surged on board, Ragtime music floated from her promenade deck. They squeezed through the mob to claim an empty chair, their first beer or a spot in the smoking lounge or along the rail to wave their handkerchiefs in happy farewells. It was the kind of day you proposed to your girl, put your toddler in his best sailor suit. And maybe when the ship first rolled and righted, you gasped, then laughed out loud. Maybe you skidded and your stomach tightened but saw the ship was still lashed to the dock. When it tilted again, the band braced and kept on playing. But then it leaned far over. In the stunning quiet a piling ripped from the pier like a yanked tooth and under the weight of too many passengers, too little attention to ballast, the tall, narrow ship rolled right over on its side into the filthy river. Deck chairs, tables, china, lovers thrown. The piano slid and crushed a man. Straw skimmers, music stands, the big safe. A refrigerator toppled. Bottles, exploded glass. Layers of fancy clothes dragged mothers under. The calliope. A small boy, his head lolling. Baskets, music stands, mandolins. Gawky young men slammed, pinned. Umbrellas, bookcases, babies, girls and grandmothers plunged below. They fought for air, fought for help, fought each other. Men helped women; men clawed and clambered over women, and children slipped from their hands. Mouths open in shock filled with water. Rivets popped. The ship shuddered and growled. Those trapped in the black interior groped for purchase in pockets of air. Held to each other. Held on alone. The whole city galvanized and sprang to action. They threw beams, chicken crates, life preservers. They leapt, arms stretching, legs kicking, into a soup of bodies, trash and screaming. Grappling hooks and nets fished the river. They cut open the Eastland’s hull and dropped ropes, ladders, helmeted divers. A young man the newspapers called “the human frog” dove past exhaustion to pull up forty bodies on his own. The weight of sodden, tangled clothes. Dresses clawed to shreds. Hands full of hair. Bodies were hauled to the great maw of the armory and laid out for someone to come and identify them. The majority of the dead were young women and children. The city ran out of coffins. Marion Starling Boyer is a professor emeritus of Communication courses at Kalamazoo Valley Community College. She has two published collections of poetry, The Clock of the Long Now (2009, Mayapple Press) and Green 2003, Finishing Line Press). Boyer’s Composing the Rain won Grayson Book’s 2014 chapbook competition and publication is forthcoming. She enjoys spending her summers in South Haven, Mich..